It is the destruction or removal of all pathogenic micro-organisms which give rise to infection, but not necessarily their spore forms. It is the process by which an article, surface, or medium is freed of all microorganisms either in the vegetative or spore state. With the whole world looking at the eradication of existing infectious diseases and preventing any new infections, sterilization of instruments is significant to ensure optimal patient care. In contemporary dental practice, the instruments directly come in contact with tissues, blood and tissue fluids, saliva, and gingival crevicular fluid which may seep through the rubber dam if not properly placed. The prevention of cross-contamination of infectious diseases among dentists, dental staff, and patients is a major concern in dental practice. Also, aseptic technique is especially important in endodontics because microorganisms are the major cause of endodontic disease. Apart from maxillofacial surgery, the potential for cross-infection is highest in the prosthodontic environment. Dental burs have been identified as a source of cross-contamination between patient and dental personnel. They may become heavily contaminated with necrotic tissues, saliva, blood, and potential pathogens during use. However, it is difficult to do the pre-cleaning and sterilization of burs because of their complex architecture. Hence, a strict sterilization protocol is essential as the risk of cross-infection is higher. Various methods have been proposed by many manufacturers for this purpose, namely, the autoclave, dry-heat sterilization, laser, chemical sterilization, etc. Therefore, the present study was designed to investigate the pathological evaluation for sterilization of routinely used prosthodontic and endodontic instruments. To investigate the effectiveness of various sterilization procedures commonly applied to used burs. To investigate the effectiveness of various sterilization procedures commonly applied to used endodontic files. This is an in vitro study in which used burs and files were considered for sterilization. After sterilization, they were incubated for a period of 72 h. Ethical clearance was obtained from Sridevi Institute of Medical Sciences and Research Centre. Procedure and purpose of the study was explained to the participants from whom used burs and files were obtained, and their consent was taken. A total of 60 previously used No. 8 round-head carbon steel burs and 60 used endodontic No. 20 hand files were used in the present study. An unused bur was placed in a sterilized hand piece and used for cavity preparation. After use, the bur was removed from the hand piece. It was placed in a sterile tube and cleaned properly by scrubbing. Similarly, an unused No. 20 file used for endodontic purpose was collected in a sterile tube and cleaned properly by scrubbing. Out of the total 60 burs and 60 files, 12 burs and 12 files were taken as the control group (group E); the remaining 48 burs and 48 files were divided into four groups of 12 each and they were tested for the efficacy of sterilization with different methods such as autoclave (group A), glass bead (group B), glutaraldehyde (group C), and Quitanet plus solution (group D). The 12 contaminated burs and files in group A were placed in an endodontic instrument box and subjected to autoclave at 121°C for 15 min at a pressure of 15 pounds. The 12 contaminated burs and files in group B were wiped for 10 s with surgical spirit and placed in the periphery of the glass-bead sterilizer and sterilized for 45 s at 240°C. The 12 contaminated burs and files in group C were placed in a sterile plastic container containing 2.4% glutaraldehyde solution and left in it for 12 h.
The 12 contaminated burs and files in group D were placed in a sterile plastic container containing Quitanet plus solution and left in it for 12 h.
The 12 contaminated burs and files in group E (control group) were put in separate tubes without doing any sterilization. On completion of the procedure, the burs and files were transferred in a sterile fashion into test tubes containing a culture medium selected to grow oral bacteria (Todd-Hewitt broth). The control group comprised new unused instruments treated in an identical fashion before culturing. All samples (N = 120) were then placed in an incubator maintained at 37°C to mimic body temperature. The burs and files were examined daily over 72 h to check for evidence of bacterial growth. 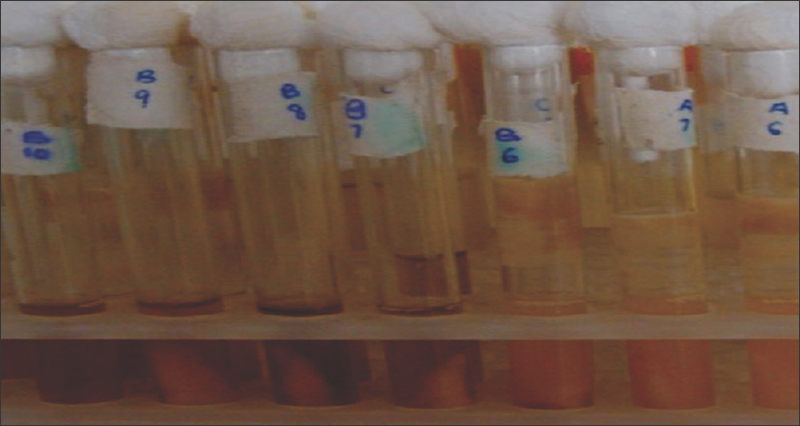 A color change, cloudy broth, and visible precipitate in the test tube were all considered as indicative of bacterial growth [Figure 1]. If the solution remained clear throughout the incubation period, the sample was considered sterile. In the study, the endodontic files sterilized by autoclaving in an instrument box at 121°C for 15 min at a pressure of 15 pounds (group A) showed total sterility. Ten burs (83.3%) subjected to sterilization by glass-bead sterilizer and seven files (58.33%) after wiping for 10 s with surgical spirit and sterilized for 45 s at 240°C (group B) showed incomplete sterilization [Figure 2] and [Figure 3]. Burs and files sterilized by immersing in glutaraldehyde (2.4%) for 12 h (group C) showed complete sterilization. Ten burs (83.3%) and nine files (75%) showed incomplete sterilization with Quitanet plus (group D) solution. The control group (group E), for which the files after contamination were not sterilized by any method, showed growth in all samples. Statistical analysis of the four sterilized groups using K analysis of variance (ANOVA) showed a statistically significant difference between groups with regard to their efficacies in sterilization of both with burs and files (P ≤ 0.05) [Table 1] and [Table 2]. The risk of disease transmission is unknown in endodontic procedures; even if the risk of disease transmission is minimal during endodontic procedures, the high frequency of root canal treatments could increase the possibility of an adverse event. , This is one example of why it is so important to ensure that resterilization procedures are effective. There are three principal methods currently available for sterilization of instruments: Steam under pressure (autoclave), dry heat, and chemiclave. Another method of sterilization, viz., laser, is also available but not widely used. Many methods have been advocated for sterilization of endodontic instruments. Steam autoclaving and glass-bead sterilizers are among the commonly recommended methods of sterilization. At present, only a few dental instruments cannot be sterilized and these are either disinfected or disposable. The complex miniature architecture of dental burs and endodontic files makes precleaning and sterilization difficult. The present study showed that complete sterilization was possible by autoclaving the instruments in an endodontic box. This is significantly similar to the findings from studies of other researchers like Hurtt et al.,  Rajkumar et al.,  and Velez et al. Damaging alterations of proteins by dry heat are a result of oxidation, desiccation, and changes in osmotic pressure owing to evaporation of moisture. Dry heat sterilization is slower and requires temperatures higher than those used in moist heat sterilization. This study showed that sterilization by a glass-bead sterilizer was not able to completely eliminate microorganisms and that total sterility was not found. The present study result was contradictory to that of previous research done by Rajkumar et al.,  but it was the same as that of Hurtt et al. who performed their study with salt instead of glass bead. Quitanet plus is commonly used nowadays in the dental office for sterilization of burs and files. It can be concluded that it is not an effective means of sterilizing burs and files. In the present study, autoclaving and glutaraldehyde resulted in complete sterilization. 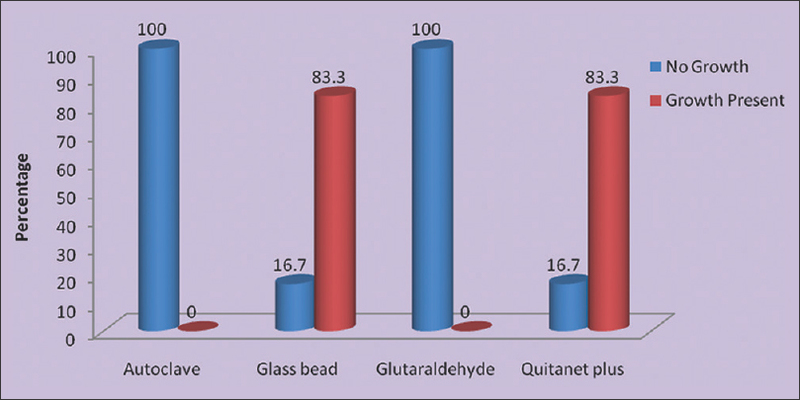 Glass-bead sterilizer can be used as an alternative when these two methods are not available, but the problem with glutaraldehyde sterilization is tissue toxicity. Though autoclave is an effective method for sterilizing endodontic files, the time taken by it to sterilize is more. Hence there is a need for an alternative method which has a good sterilization capacity and involves less time. Farias AF, Rai S, Rao T. Life on the edge for the Indian dentist: A look at infection control and its application for Indian dental offices. Int J Infect Control 2014;10:1-8. Woods R, Amerena V, David P, Fan PL, Heydt H, Marianos D. Sterilization: Part 1. Instrument preparation. FDI World 1996;5:7-10. Whitworth CL, Martin MV, Gallagher M, Worthington HV. A comparison of decontamination methods used for dental burs. Br Dent J 2004;197:635-40; discussion 623. Gordon BL, Burke FJ, Bagg J, Marlborough HS, McHugh ES. Systematic review of adherence to infection control guidelines in dentistry. J Dent 2001;29:509-16. Smith A, Dickson M, Aitken J, Bagg J. Contaminated dental instruments. J Hosp Infect 2002;51:233-5. Ingrosso L, Pisani F, Pocchiari M. Transmission of the 263K scrapie strain by the dental route. J Gen Virol 1999;80:3043-7. Miller CH. Sterilization. Disciplined microbial control. Dent Clin North Am 1991;35:339-55. Vélez AE, Thomas DD, del Río CE. An evaluation of sterilization of endodontic instruments in artificial sponges. J Endod 1998;24:51-3. Rajkumar K, Lakshminarayanan L. The effectiveness of two commonly used methods of sterilizing endodontics. J Indian Dent Assoc 2001;72:245-8. World Health Organization (WHO). Bio-Medical Waste Management Self Learning Document for Nurses and Paramedical. Hyderabad, Andhra Pradesh: Environment Protection Training and Research Institute; 2004. p. 1-74. Morrison A, Conrod S. Dental burs and endodontic files: Are routine sterilization procedures effective? J Can Dent Assoc 2009;75:39.